Guess what people????!!! CNBLUE is coming to Malaysia to do their first solo performance at National Stadium, Kuala Lumpur on 24th August on this Saturday! Yeeehahhhh! 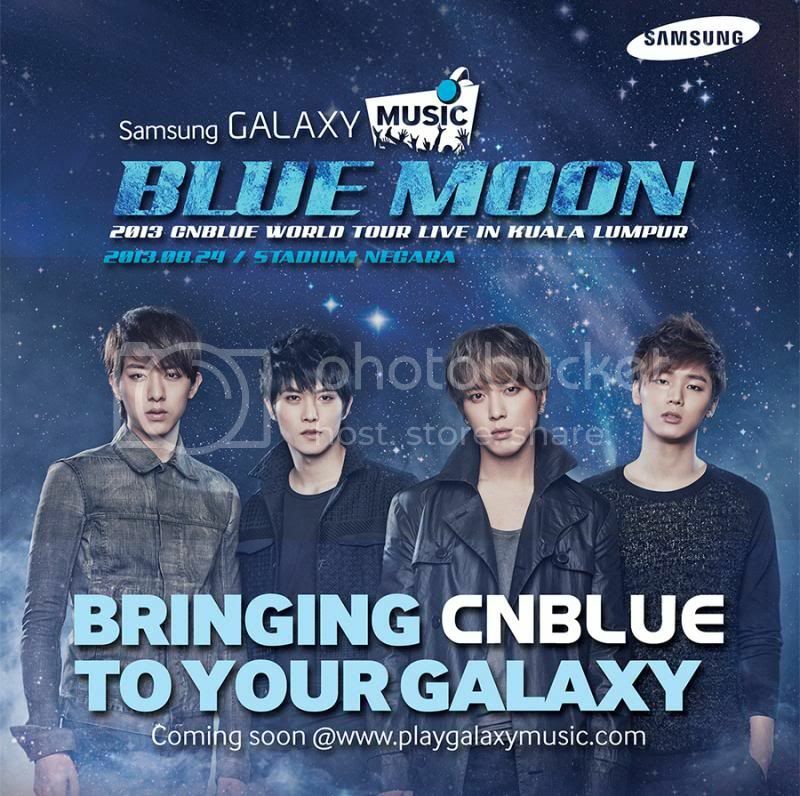 !~~~ Thank you Samsung for being the sponsor of CNBLUE Blue Moon World Tour and all the fans out there finally have the opportunity to watch CNBLUE perform live in KL! To those who don't know, CNBLUE is a South Korean rock band formed in Seoul in 2009. The band consists of Jung Yong-hwa (lead vocals, rhythm guitar), Lee Jong-hyun (lead guitar, vocals), Lee Jung Shin (bass guitar, vocals) and Kang Min-hyuk (drums, vocals). CN is an abbreviation of 'Code Name' while BLUE is an abbreviation of the members’ individual images. The band debuted on August 19, 2009 in Japan with their first mini album, Now or Never. They released four teasers for their 1st Korean mini album Bluetory, starring one member per each of the videos in the sequence of Jonghyun, Minhyuk, Jungshin and lastly, Yonghwa. On January 14, 2010, CNBLUE debuted their first mini-album in Korea with the lead single "I'm a Loner" (Korean: 외톨이야). Their fan club is called "Boice". New album has been launched, which is [RE:BLUE] in the first half of 2013. One of my favourite song is 직감 from CNBLUE 1st Album "First Step". On January 22, FNC Entertainment announced the 2013 CN Blue Blue Moon World Tour, stating "They won't be going to just Asian countries such as China, Singapore, and Hong Kong, but also Europe, Australia, North America, and South America.”. The label confirmed stops for Taiwan, Singapore, Thailand, Hong Kong, Philippines, Malaysia, and Australia, and is in the process of planning America and Europe stops.Taiwan will be the first stop for the world tour starting on April 6,making them the first South Korean rock band to hold a world tour of this kind. Are you all excited? *wide grin* I'll be going to the CNBLUE Blue Moon World Tour concert on this Saturday! I am super excited as my favourite Jung Yong-Hwa, the lead vocal from CNBLUE is performing live on this Saturday! *drool* So hope to see all the CNBLUE fans there! Can't wait to watch for their performance. Hooray!